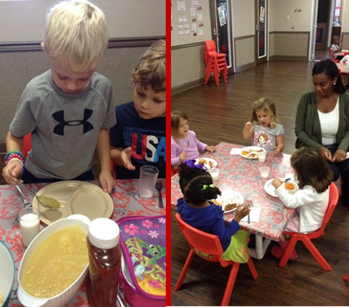 In family style dining all food is placed in serving bowls and children are encouraged to serve themselves. 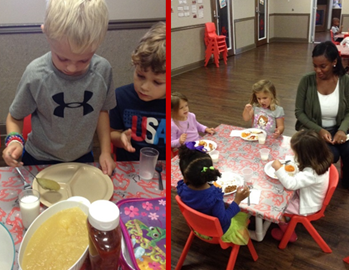 Teachers sit with the children during the meal and encourage good table manners. Family style dining promotes good social skills as children take turns, pass food to others, and say please and thank you.Â Children develop positive self-esteem as they become more independent and family style dining is a great way to encourage that process. Family style dining also promotes motor skill development as children use utensils to serve themselves, use pitchers to pour their drinks, and learn to use utensils to feed themselves.Â It is important to allow children this time of exploration and to make mistakes. Spills and messes will occur but it is important to continue encouraging children in the process.With daily repetition and consistency children will master family style dining! Visit us atÂ www.LegacyAcademy.comÂ to arrange a visit.